This is part of a series of articles on games in Berlin – click here for the introduction and links to all the other articles. Claustrophobia is unusual in the Berlin scene for having opted to take a venue right in the heart of the city. In fact, it’s located in the middle of a shopping centre. Head for the food court end and then up to the very top of the building, where they’ve got three rooms on offer with very different themes. The staff were incredibly welcoming throughout, although I found during the game that the GMing was a little hit and miss. We had to ask for hints two or three times on multiple occasions, while our sister team found that the clues they got at one point ended up getting them more frustrated than when they’d started. That ties in with other Claustrophobia games I’ve visited, which is especially unfortunate given that, even amongst experienced players, needing a hint is a fairly common occurrence in their games. Personally, I really enjoyed Vault 13 and the Museum of Contemporary Art but found Pirate Hut relatively weak. The other team we played with didn’t get on very well with the Museum. If you’re a fan of Fallout, or of post-apocalyptic stories in general, then I suspect that Vault 13 will be particularly appealing. I’ve never played Fallout but, if they were looking to create a bleak underground post-apocalyptic shelter, then they’ve done a great job. Throughout the game, I was impressed by what they’d produced. There may have been a few rough edges here and there, but there were also plenty of highlights, including one towards the end of the game that, while only for show, was still stunning. Right from the moment you arrive in the game, you can see into areas that you don’t yet have access to. This created a good sense of anticipation and encouraged us to look forward into the game rather than backward to the outside world. 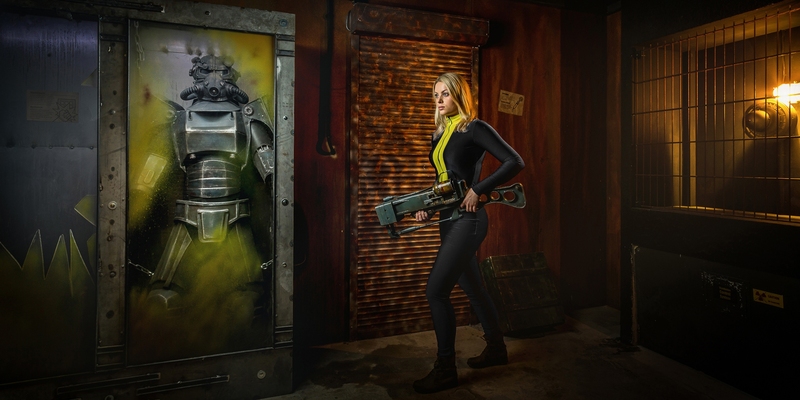 There’s a very clear mission in Vault 13: to escape from the underground bunker after generations of living underground. The twist they’ve created is that, rather than having to escape yourself, you need to convince the AI that runs the bunker to open it up. I liked that mechanic and the way it shone through the steps we took in the game. In fact, there was a feeling throughout the experience that the tasks we undertook were very much the steps on that mission rather than arbitrary puzzles. In that vein, the tools we encountered along the way weren’t always used in their originally intended manner, which is something I always find appealing. Having said that, there was reasonable guidance at most steps along the path to escaping, so that we had a clear idea of where to go next and what to do. As is typical with Claustrophobia games, there were moments where we got utterly lost – unclear about which direction to go in next. Unfortunately, we missed the subtle clue they’d given us, which meant it quickly became frustrating. That was where things went a little downhill. Our GM was spectacularly inattentive, to the point that, on two separate occasions, we had to ring the clue button three times to get help. One of those occasions was when a particular piece of equipment had malfunctioned, so it wasn’t a case of them abandoning us because they thought we were close to solving a puzzle. The most unusual part of the room – as they explain to you in the briefing – is undoubtedly the use of force. On multiple occasions during the game, you’re required to interact with the game in a way that you never would in many escape rooms. Even as someone who’s played >500 games, one of those occasions was a first for me. The frustrations with GMing never became too significant (perhaps because we got to let off steam by using force on things 🙂 ), so we reached the finale fully engaged and were rewarded with a thematic ending that saw us complete our mission and escape in a manner that suited the story well after around 40 minutes and two clues. Having just come through a room where force was not just allowed but at times actually required, it was quite a contrast to be playing a game in an art gallery. And it really was an art gallery, with a variety of modern art adorning the space – either copies of real works, at the very least, slight variants on them. They’d managed to capture both the seriousness and the silliness that abound with modern art, creating a space that I enjoyed wandering through. The challenges were surprisingly on theme, making use of much of the art to create fun and unusual puzzles. As per usual with Claustrophobia games, there was a risk that, if you didn’t work out the logic behind a puzzle, you could be spending a lot of time making very little progress. One in particular seemed like a significant leap – we solved it by an entirely different method to the intended one, but our sister team unsurprisingly called in a clue. It’s hard to give a rating to a room like that – some teams will waltz through with barely a pause, while others will hit roadblocks several times in the game, with all the frustration that entails. On the other hand, there are moments that I found quite humorous and might relieve some of that tension with the almost whimsical nature of a couple of puzzles that fitted well with the modern-art theme. That humour makes an appearance during the final puzzles too. While you’re not told at the outset exactly why you’re breaking into the museum, it becomes apparent relatively early on, and the game teases you with the treasure through a mechanic that seemed playful. That’s a nice idea which meant that, even when we’d completed everything and went to retrieve our prize, there was just a little tension that there might be one last surprise. In the end, in a room which had a couple of moments that you might describe as logic leaps, we escaped in 35 minutes with just one clue, on a puzzle that we absolutely could and should have got without help. It turns out, escaping is an art not a science. The final of our games at Claustrophobia was their pirate-themed room, where you find yourself cast upon a shore during a storm with only a mysterious hut for shelter. There’s a strong start to the game as you’re told your story and then thrown into the game proper. Inside we were greeted by a pretty space with plenty to investigate, managing not to overwhelm us while still providing enough to challenge us to pick out the important items. Unfortunately, the game was marred by a varied sequence of failures. Firstly, either the room was mis-set or something triggered at random, giving us access to a space that the other team had to solve a puzzle for. To be honest, we might not even have noticed had there not been a serious technical failure on the very next puzzle, which meant that we discussed that portion of the game at length afterwards. The particularly frustrating thing was that: (a) it was an incredibly low-tech challenge; and (b) we were given four pieces of equipment to solve it and all four of them broke in the same way. Our sister team had the exact same problem. To have a puzzle causing that much of an issue in a game is utterly unacceptable. Fortunately, we found a way round it, but it spoiled the experience at an early stage and left us untrusting for the rest of the game. Later on we hit yet more problems – one puzzle made us stop at a critical point because we could see the infrastructure of the building, and so we assumed we shouldn’t investigate further. Ironically, we were only saved because we noticed some exposed wiring that hinted at a prop being more than it seemed. Finally, the showpiece finish to the game failed to happen for us, while our teammates found it an uncomfortable experience. All the above paints the game in an incredibly negative light but, in truth, most of it was solid, with several puzzles that were fun. I guess that, where the puzzles were logical, we zoomed through them, and so every frustration felt so much the worse. For me it was by far the poorest of the three games and, indeed, of any Claustrophobia room I’ve played. That’s all on this venue – want to read more about Berlin games? Click here to head back to the main Berlin page.